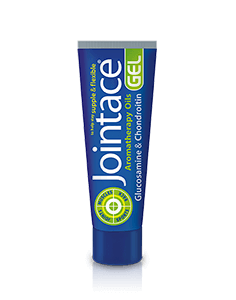 Jointace Original contains glucosamine sourced from natural chitin. Diabetics and those taking anti-coagulants (blood thinners) should consult their doctor before using this product. This formula replaces other Jointace supplements. A regular intake is recommended. Jointace Original is recommended with a balanced diet, rich in fish oil. As with other food supplements, consult your doctor before using if you are under medical supervision, pregnant, breast-feeding, have epilepsy, suffer from food allergies, or are allergic to any of the ingredients. Not suitable for children. Food supplements must not replace a varied and balanced diet and a healthy lifestyle. Store below 25°C in a dry place, out of sight and reach of children. Why have Jointace Original tablets been developed? Can Jointace Original tablets be used simultaneously with medicines? How many tablets does one pack of Jointace Original contain? How and when should Jointace Original tablets be used? Are there any undesired effects whilst taking Jointace Original tablets? For how long should Jointace Original be used? 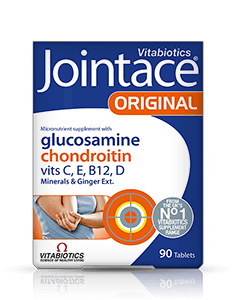 Are Jointace Original tablets recommended with any other Vitabiotics’ product(s)? Why has Calcium not been included in the formula? 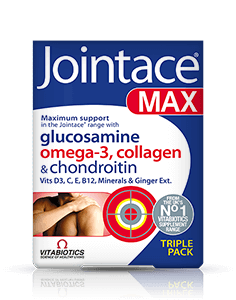 Jointace Original tablets have been scientifically developed to help safeguard your diet with specific nutrients which help to support normal cartilage and bone health which are important for long term wellbeing and maintaining an active lifestyle. 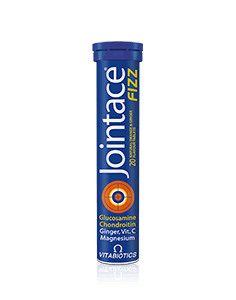 Jointace Original tablets is a food supplement and contains only moderate levels of vitamins and minerals. For specific advice on taking Jointace Original tablets with medicines, we recommend that you contact your doctor or pharmacist first. Diabetics and those using blood thinning medication should consult their doctor before using this product. 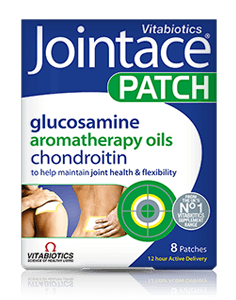 Jointace Original is available in 30 tablet and 90 tablet packs. It is recommended to take 2 tablets per day. Two tablets per day are recommended with or immediately after your main meal, with water or a cold drink. Jointace Original tablets should not be chewed. Taking the tablets with a large meal maximises the absorption of the nutrients and can reduce nausea, which is sometimes experienced if multivitamins are taken on an empty stomach. Always ensure that Jointace Original tablets are taken with plenty of liquid to wash the tablets down, and not tea or coffee, as this may cause the tablets to disintegrate too early. 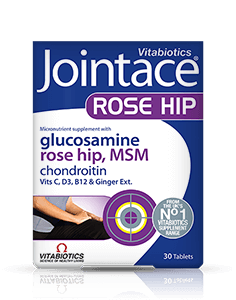 Jointace Original tablets have no known side-effects when taken as directed. Do not exceed the recommended intake. In case of overdose, seek medical advice immediately. Jointace Original tablets may not be suitable for use by those people allergic to shellfish. Diabetics and those using blood thinning medication should consult their doctor before using this product. There is no maximum length of time over which Jointace Original tablets may be used. A regular intake is recommended. 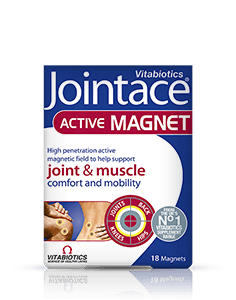 The benefits of Jointace Original tablets may be enhanced by use alongside other topical (external use) products in the Jointace range, such as Jointace Patch, Gel & Magnets. 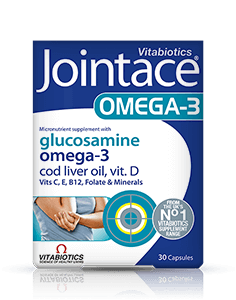 Jointace Original is also ideal in combination with a calcium supplement, such as Vitabiotics Osteocare, and/or additional fish oil, such as Vitabiotics Ultra™ Omega-3 oils. Calcium is an essential mineral as it is needed for the maintenance of normal bones. 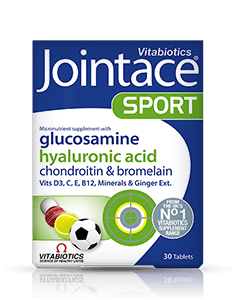 However, it has not been included in the Jointace Original formula as it is not possible to include the right amount in one or two tablets as well as the other ingredients in Jointace Original. 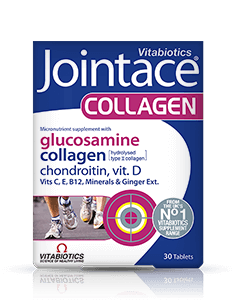 Rather than including a token amount of Calcium, Jointace Original has been designed so that it can also be taken with Vitabiotics Osteocare tablets, chewable tablets or liquid. "For months I have been taking Wellman 50 and Jointace Sport and have no doubt that these supplements have helped improve my fitness. I used to have to take a day off after every game but now I'm playing flat out almost every day.